Welcome to our 2019 3D Printer Buyer’s Guide. 2018 has been a bit of a shake-up year for the 3D printing industry, seeing big players like Printrbot close their doors and a few others tightening their belts. Some tech observers have seen this and taken it as a sign that the 3D printing industry is failing and it’s time to move to the next big thing. A careful observer will see that sales are still going strong, new users are entering the market every day, and those companies who have found their place are digging in for the long run. The startup hype may be over but now it’s time for a maturing industry to get the real work done. This isn’t to say that there are not exciting things happening. Machines are getting better, more cost effective, and more configurable, and more accessories are coming to the market. MatterHackers offers a Dell Computers-like buying experience for their Pulse printer, allowing you to select the features you want. LulzBot has taken advantage of their recent switch to E3D hotends by releasing an optional fine-detail tool head months after the LulzBot Mini 2 launched. Prusa’s new MMU2 adds a ton of functionality to their already feature-rich machine. This, of course, is just a short list but enough to get enthused about not only where we are, but where things are going. Each year our team gathers for our shootout testing weekend, three straight days of putting these machines through our continuously improving process to try to see how they stack up against each other. For the second straight year, we held our shootout in Digital Fabrication Editor Matt Stultz’s home hackerspace, Ocean State Maker Mill in Pawtucket, Rhode Island. The team consisted of other makerspace members who have extensive experience with 3D printing, CNC milling, laser cutting, and other digital fabrication processes. For the fused filament fabrication (FFF) machines, the initial testing is just the start, leading to blind print scoring of our test probes, comparing our notes, and really diving into the details of the machines to find the standouts. Our Digital Fabrication Guide is one of most popular issues every year. We continue to try to improve our tests based on reader feedback and are always looking for new machine types that we think you will be interested in. I hope you enjoy this year’s guide and that it will help you find that special tool you’ve been looking for. Our FFF test probes allow us to quantify how well the printers will produce parts. Here is a breakdown of the tests we use and how we score them. With this probe, we look for echoing or banding on the surface of the print. These will be located along the letters or the holes in the back. The worse the disruption, the lower the score. There are three sections to this test, a slope, a flat section, and a dome. We are looking to see how cleanly those sections are formed. Any holes, pimples, or ridging will lower the score. This probe allows us to measure how accurately the printer produces parts to size. The second step should be 20mm wide in both directions. For each .1mm the printer is off on average, it loses a point. The overhang test starts out at 30º and continues to 70º. We look for how cleanly the back of the print comes out. Drooping and looping especially in the lower numbers will reduce the score. Bridging is a printer’s ability to span a gap between two points. Each gap on this probe is wider apart than the last. A good part should have all the gaps bridged cleanly. Drooping and lost infill reduces points. Negative space tolerance is important for things like bolt holes and creating print-in-place features. Each hole in the test is .1mm smaller than the last. The more pins that can be pushed out, the higher the score. Poor retraction can cause stringing, jamming, or the inability to extrude fine features. These spikes test your machines retraction performance. Any of the issues listed can reduce the score of the print. This is an updated test for this year. This tree tests how well support material is formed to a print. It tests four conditions that are a combination of flat and textured print areas. The print is scored based on how cleanly the material can be removed. This test is one of two new tests for 2018. Five squares are printed around the bed, each are measured with an angle gauge to see how close they are to 90º. The further off they are from 90º, the lower the score. This is our other new test this year. We heard feedback from our readers who wanted to make sure the printers could print out to the edges and also stayed accurate with big prints. We measure this print and the less accurate, the lower the score. This tower tests to see if there is any wiggle in your z-axis causing repeated ridging along the sides. This is our lone pass/fail test now and scores a 0 (fail) or 2 (pass). Philip J. Angileri has been an industrial designer for over 20 years. He is president and principal for design and engineering firm NarrowBase (narrowbase.com), and is an active member of Ocean State Maker Mill, where he co-founded their Robotics Club. Adam Casto is a Linux sysadmin and maker. He is an active member of HackPGH and 3DPPGH in Pittsburgh, PA.
Chad Elish is a driving force in the maker movement. He’s the president of HackPGH, produces Maker Faires throughout the U.S., and co-founded Nation of Makers. Simon Norridge has been a maker since building his first computer in the early 1970s. He now focuses on creating with CNC and 3D printing systems at Ocean State Maker Mill. Jonathan Prozzi is the director of education at the Digital Harbor Foundation where he develops technology content and resources for youth and educators. Jennifer Schachter has a degree in fine arts, but despite that, finds herself building and tinkering more often than painting and drawing. Mandy L. Stultz is a founding member of Ocean State Maker Mill. She favors fiber arts, but explores digifab tools to help in these ventures. Samuel N. Bernier is the creative director of Paris design and innovation firm, le FabShop. 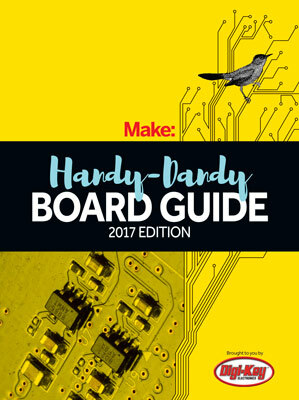 He’s the designer of the articulated Makey, and his first book, Design for 3D Printing, is now available from Maker Media. Jason is a Rhode Island-based figurative sculptor mainly working in the toy industry creating characters that are played with and adored throughout the world. He also spends part of his time teaching at Massachusetts College of Art and Design. Claudia Ng is a 3D printing enthusiast who began a small business selling 3D printed plant-toting creatures, Succulent Monsters. A majority of the proceeds are donated to local charities. Jim Rodda, best known to Makers as Zheng3, is an indie video game developer who frequently blogs about 3D printing, Maker culture, and constipated dinosaurs at zheng3.com. Madelene Stanley is a longtime cosplayer who channeled her hobbies into a successful Etsy shop creating 3D printed costume accessories. She currently volunteers for 3D Hubs. Shawn Grimes is the Director of Technology at the Digital Harbor Foundation where he works to teach technology and Maker skills to youth and educators. Steph is a former Kindergarten teacher turned educational technologist. As the Director of Education at Digital Harbor Foundation, Steph has worked with a variety of youth and educators of all types teaching hands-on 3D printing workshops over the last 3 years around the country. When Spencer Zawasky isn’t working for an embedded systems company outside Boston, he’s usually 3D printing. Often you’ll find him 3D printing at the Ocean State Maker Mill in Pawtucket, Rhode Island.